My skills include: Juggling (funny: hedgehogs, haggis, turnip, potatoes, balls, clubs and dangerous: knives, baseball bat, axe, machete, baseball bat, fire), Magic (close up and stage),Balloon Modelling, Penny-Farthing, Unicycle, Roller Bowler (a plank balanced on a tube), Hat Manipulation, Whip Cracking. I can perform as a juggler or magician. Normally I would combine the two with the other skills that I have. Experience: I have been a professional juggler magician since 1992 and full time since graduation from Glasgow School of Art in 2000. I started juggling when I was the manager of a kite and juggling shop (I was a kite flyer at the time). I was first offered work doing juggling workshops, I then met an agent/performer at a holiday camp. He offered me my first performing jobs mainly in shopping centres doing walk-a-bout. From there I progressed to doing juggling shows and increased my repertoire to include magic, balloons and all the other skills. 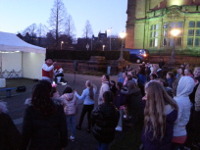 I have been continually developing my shows to a level were I can perform juggling or magic to the most demanding of audiences (13 year old Glasgow boys). I have worked: in top hotels, restaurants, private and public functions, car show rooms, shopping centres, Murrayfield, Hampden and Parkhead football grounds as well as other sports events, a nuclear power station open day, exhibited in Edinburgh Zoo, Stirling, Edinbugh, Dean Castles, STV, BBC, Cannel 4, Discovery channel (Canada) and loads more. Graham has been the main organizer of 5 Scottish Juggling Conventions in Glasgow and one British Juggling Convention in Perth. So knows and sympathises with the problems of event organising. What sort of venues: I change my act to suit the venues, be it a stage show in a theatres, hotels or an outdoor gala day. I have my own PA with two 200 watt speakers, radio microphone and CD/mp3 player. The PA is adequate for most small to medium size halls, I use it for school shows with an audience of 400 kids. Larger halls and events tend to have their own system. I now have a battery operated street amp so can do a show anywere. Walk-a-bout: otherwise known as mix and mingle, is best suited to gala days, shop openings, or places were you do not want a static show but an entertainer moving around, interacting with the guests in smaller groups. For walk-a-bout: I tend to do close up magic, balloons and some juggling. I can also do walk-a-bout from a penny-farthing or should that be called ride-a-bout. I ride about and jump off the penny farthing, do some magic or chat, I even put kids on the penny farthing and push them around giving them the experience of a lifetime. This is also a good photo opportunity for the parents. Shows: Shows can either be stage or street type events. Street just means no stage and totally surrounded this can be done in the middle of a field. I can vary the shows for kids to adults combining juggling and magic. I tend to prefer a mix of the two, to a level where the whole family would enjoy it. You will have to let me know if you would prefer me not to use knives, fire whips etc.